When the twin towers collapsed on September 11, 2011, one of the most critical challenges that first responders faced was cutting through concrete to get to victims trapped under debris  a painful and tedious race against time when tragedy strikes. Breaching reinforced concrete has long been a losing race when relying on drills, saws, and jackhammers. The Department of Homeland Security's Science and Technology Directorate (S&T) has developed a new tool to help fire departments and search-and-rescue teams overcome these challenges caused by fallen in natural and man-made disasters. 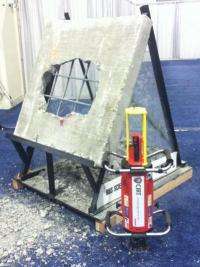 In 2007, S&T spearheaded the development of the Controlled Impact Rescue Tool (CIRT), designed to cut through concrete with speed and precision. The CIRT uses blank ammunition cartridges to drive a piston that generates a high-energy jolt to create a contained hole in the concrete. A series of these holes allows the creation of an area large enough to deliver vital supplies such as food, water and medicine to victims before first responders are able to get victims to safety. The force generated by the CIRT is concentrated in a localized area, minimizes threats to the safety of survivors and the potential destabilization of the surrounding structure. 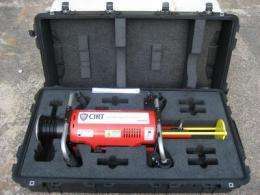 CIRT is the size of a small suitcase and weighs approximately 100 pounds, making it mobile enough for a pair of rescuers to hold against a wall, yet heavy enough to limit recoil that can cause injury. It is capable of breaching a reinforced concrete wall up to four times faster than traditional methods. The Federal Emergency Management Administration (FEMA) has already acquired six CIRT units to add to their search-and-rescue capabilities. S&T also plans to distribute CIRT units to municipal search-and-rescue teams in Cincinnati, Los Angeles, Seattle, Fairfax County and Virginia Beach, Va., and Texas Disaster City®, a training ground used by urban search-and- rescue (USAR) specialists. 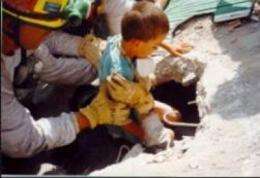 In 2008, Popular Science magazine identified S&T's concrete-blasting lifesaver as a "Best of What's New." "That pleased us, but since then, we've refined the design to make it even more affordable for urban search-and-rescue teams across the nation," says Jalal Mapar, project manager of S&T's Infrastructure Protection & Disaster Management Division. CIRT has now completed all phases on research, development, testing and evaluation, and is currently being manufactured by Raytheon, S&T's research partner on this project.